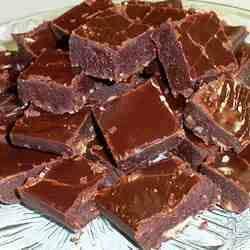 One of my favorite memories of my Aunt Bessie (Hollen) Box was her fudge. Sometimes it would be perfect an' wonderful. Sometimes it would be almost right but "soupy" as she'd say. I remember times when she would call, "Steve, I've made fudge and it's soupy. Come on over an' grab a spoon." Oh my, we would sit with spoons in hand, scoopin' up soupy fudge, talkin' an' laughin' for ever so long. Eventually she would get up an' make us each a glass of Lipton Instant Tea to wash the sweet chocolate down. Lordy, she could cook. Fried chicken, pork chops, fried taters, green beans cooked low an' slow with a little pig meat. She canned so many things. I remember goin' several times to a local farm and we picked bushels of green beans. We sat outside an' broke beans all day. We'd wash them an' put them in jars. As her pressure cooker would finish one batch a new load would go in, jar after jar all day. She didn't use recipes when she canned or cooked. I helped her make kraut an' pickled green tomatoes, tryin' to learn her recipe. The palm of her hand was her measurin' spoon. Her measurements were "a handful", "just a little bit" or "just a pinch or two". I never learned to can like her. Oh, I can follow a recipe and do fine, but no one will ever can a jar of green beans like my Aunt Bessie did.